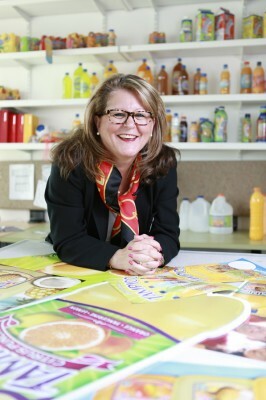 In her role as the VP of marketing at Tampico Beverages, a Chicago-based company that makes a unique blend of fruit-flavored punches, Marta Gerdes considers herself a “brand ambassador.” By 2011, when Tampico offered her a position with the company, she had already retired from a nearly 20-year career in corporate marketing, and was working as a consultant on her own time. “I realized that this was the perfect opportunity to continue down that path without giving up the hands-on, entrepreneurish spirit,” she remembers. Since rejoining the corporate world, Gerdes has worked with bottlers, retailers, and consumers to articulate the brand’s identity as a family and youth-friendly product, and keep the company engaged with their loyal customer base. Before Gerdes joined Tampico in 2011, the company had been working to enhance their business profile, boosting certain elements of the business to make sure they were growing, and not simply achieving more of the same. When they brought Gerdes on, they wanted to make sure that same effort would be made with their marketing department, and that the department would resemble that of a world-class company. What’s your favorite part of your job? It’s the people. I’ve been extremely fortunate that we have a fantastic team of players that have landed at Tampico from different areas and all share the same spirit and quest that makes us culturally unique. My ability to interact with this team of people is really a pleasure, and something I look forward to day and day out. What did you want to do before you wanted to do marketing? I was a child psychology major in undergrad. I was really all about early childhood, and wanted to end up at a toy company designing—or playing with, as some of my family used to tell me—toys that would make a different in kids play patterns. What do you do to relax? My husband and I are huge adventure travelers. We just came back from a trip to Antarctica, and from hiking the Inca Trail. Who have been your most important role models? My mother was a woman way ahead of her time. She would have been 80 this year. She finished her PhD, was career-minded with a tremendous sense of family, and was always about reaching further and making a difference. Gerdes identified Tampico’s key markets, and worked with field marketing agents in those markets—Chicago, LA, Dallas, and Houston—to coordinate and implement activities that would enhance the business and sales goals in those markets. The company wanted to elevate its community profile, and sought out opportunities to connect with consumers at the ground level. In Chicago, for instance, where Tampico has a strong Mexican consumer base, they showed up at Cinco de Mayo and Mexican Independence Day celebrations, offering samples and getting the brand’s name out there. In Texas, they made appearances at soccer clinics and festivals to connect with the families and youth that make up a large part of their customer base. In LA, they did the same at skateboarding parks that were hosting festivals. A substantial chunk of Tampico’s consumer base has always been young adults. As Gerdes knew well, you can’t think about marketing to youth in 2013 if you’re not thinking about social-media marketing. Another of her key initiatives when she joined the Tampico team was investigating digital media marketing trends, and figuring out the best way for Tampico to implement those into their regular marketing agenda. Using special digital promotions and direct online engagement, Tampico leveraged social media as a way to enhance their brand’s profile online. The success has been clear—Tampico gained hoards of new followers on Twitter, and fans on Facebook, where they continue to regularly deliver pertinent information to consumers. Over the past few years, in addition to revamping their field marketing, digital media, and broadcast strategies, Tampico has been careful about benchmarking their brand awareness. Using consumer research to evaluate markers like purchase intent, brand acceptance, and more, Tampico has been able to evaluate who their core consumers are, and the best ways to engage with them.